Since gaining a B.A.(Hons.) 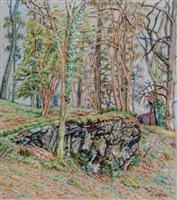 in Fine Art in 1978, Bell has continued to produce oil paintings, watercolours and drawings on a regular basis. Most of his work features the landscape, usually with trees as the dominant feature. He is an artist who likes to look afresh at his immediate surroundings, producing views from his studio window of nearby houses and gardens. Though his paintings are not photographic depictions of reality, much of his work is detailed, and reflects a close scrutiny of the scene over a considerable period of time. This lends the work an intensity and in some cases a slight air of surrealism.